One thing that I often hear from new clients is: “I was told by my doctor (PT, massage therapist, personal trainer, etc.) that I need to strengthen my core.” “Awesome! – I say – where is your core?” “My abs?” I often hear with uncertainty. Not exactly. The subject of “the core” can be a heated one since many people have very different opinions about it and some of them have built entire careers around this topic. So our intention today is not to step on anybody’s toes, but to try to figure out what the core is and what it does. Today we will focus on the structural view of the core. Usually when we talk about “the core” we refer to the entirety of your torso between the sternum and the pubic bone. The abdomen is only one small part of it. So when we look at the core structures of your body, there are several things that become obvious. Structurally we will notice that this part of your body doesn’t have many bones (except for the spine and some floating ribs), yet it contains many important internal organs that need to be kept safe and sound. Without the bony structure to rely on, the entire area needs to be wrapped up tightly to maintain the integrity of its contents. So I like to think of our core musculature as a tightly wrapped package protecting the internal organs. Here you have muscles running across the body (transverse abdominis), diagonally (external and internal obliques) and from top to bottom (rectus abdominis at the front, quadratus lumborum and erectors at the back). So this is the first purpose of your core musculature – organ containment and protection. If we did have a bony structure protecting the organs (similar to a rib cage that protects the lungs and heart), that would limit our mobility significantly and each one of is would move like a tin man, making our daily lives much more difficult (and forget those beautiful yoga back ends and deep twists). So another purpose of our core structure is to allow for greater mobility. Because of the way our core musculature is organized (vertically, horizontally and diagonally), it allows a great range of movement in the trunk. It allows us to bend forward, backwards, sideways, twist and do combinations of those. Another obvious thing that the trunk does is stabilize the top part of the body over the bottom part. It seems like no big deal, but actually being able to walk on two feet instead of four IS a big deal. It is a bit of a juggling act since the top part is heavy (head, rib cage, arms, top part of the spine, plus brain and organs). And we don’t just stand still either; we want to be able to move without toppling over! That’s why the core part of the body needs to be stable to provide adequate support for the spine that takes on the bulk of the load. Since the bony support is lacking here, the stability needs to come from both muscle tone and muscle balance from front to back and side to side. That’s why when it comes to the core, no one muscle is more important then the other. They all have to work together to get the job done, especially when the body is in motion. Another important thing that your core controls is the positions of your pelvis. 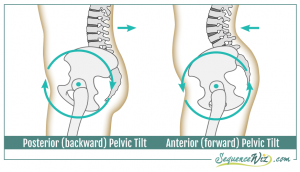 Your pelvis has the capacity to tip forward or back, depending both on your inherent structure and the way you use the body in the day-to-day life. 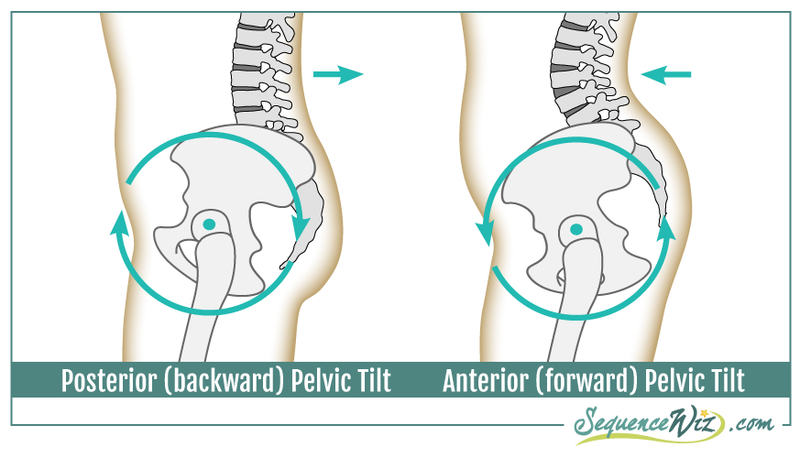 Extreme tipping one way or the other can create problems over time, so can lack of mobility of the pelvis. Your core muscles are the ones that regulate both how much movement is possible between the pelvis and the lumbar spine and where the position of your pelvis will end up on that spectrum. So we use our core musculature to consciously control the position of the pelvis during movement to train the body not to go into extremes. 4. Controls the pelvic-lumbar relationship. Each one of those functions is important for a healthy, pain-free life, and there are certain things that we can do in our yoga practice to support them. This will be our topic of discussion next week. Tune in! Thank you Kiyo! Yep, there will be plenty of that next week! Thank you Erika! This is exactly what I am going for, so thank you for summarizing it so succinctly! Hi , very enlightening an easy to understand . I will bring this to my students . Hi Olga, you are some Yoga teacher all right! Congratulations! Thank you Olga for another clear and informative article. I completely agree that the “core” is much more than just the abs. However I’m curious why you don’t include the iliopsoas as part of the core musculature, considering that it’s a key player in the #3 and #4 tasks of the core mentioned in your article (stabilizing upper body over lower body and controlling pelvic-lumbar relationship). Also, I’ve always thought of the core as a container with a top and a bottom: the bottom being the pelvic floor muscles (as they support the abdominal contents, #1 in your article) and the top the diaphragm (whose contraction and relaxation affect intra-abdominal pressure). Would you consider these muscles part of the core musculature as well? I always appreciate your insight. Thanks again! Hi Christine, thank you for your comment! I completely agree with you. I was trying to break the conversation down into manageable pieces 🙂 So this article is about core function, the next one is about the muscles that wrap around it, including psoas (http://sequencewiz.org/2015/10/28/core-muscles/) and the one next week will be about the content of the abdominal cavity with some mention of the diaphragm and pelvic floor. Thank you for your observations and please feel free to contribute if I miss something! Thanks for your response Olga! That makes sense. I look forward to reading your article next week. 2. And I’m not sure how to label theobliques on the other side; does the external oblique run diagonally top to bottom? And the internal oblique run diagonally tip to bottom? Thank you !